Never the one to be satisfied by having a single model for a particular product line, Lenovo’s Android-powered YOGA line provides consumers with diversity. Last year, for example, we were introduced to its most ambitious model in the series – the pico-projector packing Lenovo YOGA Tablet 2 Pro. 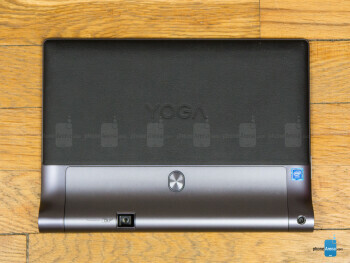 For its successor, the YOGA Tab 3 Pro, they’ve reduced it to a more manageable size with its 10.1-inch screen, while also keeping the pico-projector and upgrading the specs in the process. All of this points to a resounding multimedia consuming tablet that can be enjoyed almost anywhere, but can it suffice as being a workhorse for getting work done? Same familiar design, but with a more sophisticated faux-leather finish. Intact is the design language we’ve come to expect from the series, so this one doesn’t deviate from the norm with its cylindrical hinge design and adjustable kickstand. This, though, receives a subtle improved treatment in the form of a new faux-leather finish that covers most of the back of the tablet. 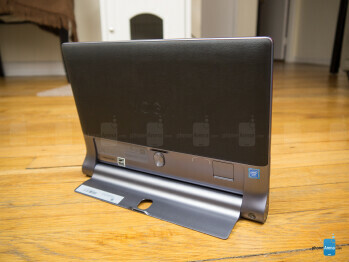 Combined with its durable metal chassis, it definitely gives it a more sophisticated look. For a 10-incher, the YOGA Tab 3 Pro tips the scale on the heavier side at 667 grams. It’s worth noting, too, that Lenovo has endowed it with an IP21 certification for protection against accidental liquid splashes. Unchanged by and large from the first generation models, we still have to credit it for its incredible flexibility in how it’s used. Most of the ports and buttons are situated in the same positions as before, but there are some changes. The biggest one pertains to the pico-projector itself, which is now incorporated into kickstand – whereas before, it was stationary in the hinge at the side. This new arrangement is a logical one because it comes with fewer hassles adjusting it, seeing that it can be positioned to our liking by rotating the kickstand. Turning it on is done by pressing on the corresponding button embedded into the side of the hinge, which powers on the 50 lumen bulb. Honestly, the best performance is achieved in complete darkness, where it’s being projected onto a white screen. Trying to use it in a room where ambient lighting is present is challenging, since it’s just not bright enough. With a resolution of 845 x 480 pixels, details appear pixelated when it reaches the manufacturer’s rating of 70-inches, but smaller projections under the 50-inch threshold make it more ideal. Luckily, there’s an automatic keystone correction feature that corrects trapezoid distortion – so that the projection is always perfectly level. Although we appreciate the added treat we get from having a built-in pico projector, its usability mainly hinges on the amount of ambient light that’s present. At home trying to watch a flick during the night is no problem at all, but it’s extremely challenging in a conference room in the middle of the afternoon. Bright and exceptionally detailed, it’s an all-purpose thing for any condition. Even though they’ve downsized it to a 10.1-inch IPS-LCD screen, it’s sweet knowing that they’ve increased the resolution to 2560 x 1600 pixels, which means the screen's aspect ratio is 16:10. So yeah, details are stunning and plentiful with this one, but at the same time, it comes with some favorable qualities that make it an effective thing for almost anything. Achieving a maximum luminance of 479 nits, it’s one of the brightest screens in a tablet we’ve come across in some time, so outdoor visibility is pretty good. Colors aren’t entirely accurate, as the magenta is heavily influenced by blue, while the whole thing suffers from a dominant green, but it still packs deep and rich tones to give the screen a sense of vibrancy. Oh yeah, it even features Lenovo’s AnyPen technology that allows us to use almost any conductive object as a pen. The updated experience puts the PRO in professional. We’ve never been fond of Lenovo’s customized Android experiences in the past, mainly because of the disorganization of the homescreen due to the elimination of the apps panel, as well as its boring operation. That all changes because this model brings out the PRO in its name, delivering the productivity goods in making its custom Android 5.1 Lollipop experience more versatile and diversified than ever before. Not only is there an actual apps panel this time around, making for a far cleaner and organized homescreen, but Lenovo’s skin is equipped with a new enhanced multi-tasking feature that rivals the implementation we get from TouchWiz or LG’s experiences. It has since been improved here in the YOGA Tab 3 Pro, as more apps are now supported by it. And yes, there’s now support for multiple users as well – so that each account has access to its own apps and content. 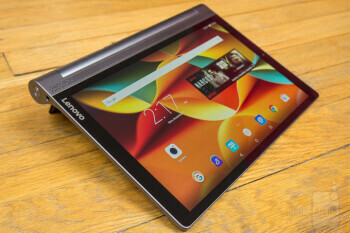 Lenovo’s approach is more ambitious with the YOGA Tab 3 Pro, which is a direction that we like. While there’s no denying that the experience is especially inviting for multimedia consumption, with the pico projector and all, it’s also adept in handling the intricacies that professionals crave with the software’s various enhancements and productivity centric features. Intel’s chip is good to handle the easy and fluffy stuff, but not entirely great for gaming. Siding with Intel once again, the YOGA Tab 3 Pro receives an upgraded quad-core 2.24GHz Intel Atom Z8500 processor coupled with 2GB of LPDDR3 RAM. This newer chipset proves quite effective at dealing with the demanding operations of its enhanced multi-tasking experience, but it can still be overwhelmed at times. This is especially noticeable when it comes to gaming, where it sputters out choppier frame rates that prevent it from being a true powerhouse. The camera receive a considerable upgrade, but its performance is still a wash. Already, it’s been treated to newer hardware just about everywhere we look – and that extends to its cameras too. Featuring a 13-megapixel rear and 5-megapixel rear combination, the upgraded treatment signifies the gap distinction between it and the other models in the series. Unfortunately, the camera experience leaves more to be desired. Our biggest complaint is simply the long time that’s needed to snap a shot. The focus adjustment seems decent, but it simply takes forever for it to finally snap the shot, save it, and get us back to snapping another one. Despite that, the interface lays claim to an abundant set of shooting mores – so that’ll appease shutterbugs at the very least. Regardless of its beefier megapixel count, the camera’s performance is not to today’s standards. It’s honestly not bad for a tablet, but don’t expect it to replace your smartphone for the occasion. Some of its qualities when the lighting conditions are ideal include soft details, colder looking colors, and chances of over-exposure. Things don’t get any better under low light, where fine details become non-existent – delivering compositions that are generally smeary in tone. Not only that, but colors are subdued and there’s some presence of digital noise too. Clearly, it’s not a strong performer with its still image capture, so we’re not having high expectations with video recording either, which tops out at 1080p. 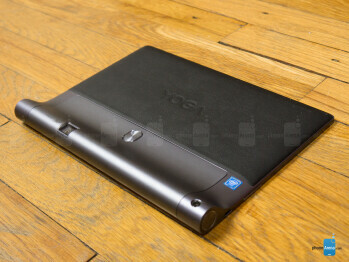 Yet again, its performance is rather flat, producing videos that are light with the details. Never once are we convinced that it’s capturing footage in ‘high-definition.’ Its quality is also marred by its noticeable artifacting elements, over-exposure, and dull colors. The Lenovo YOGA Tab 3 Pro is a multimedia powerhouse. When it comes to listening to our favorite jams, it’s the Google Play Music app that’s on tap for the occasion. Looking beneath its display, we have its speaker grill extending along the entire width of the tablet – hiding away four integrated JBL speakers. Even without enabling Dolby Atmos, the speakers deliver an immersive experience with its robust tones. Trust us, it’s exceptionally loud with its output of 79.4 dB, but its quality can be further refined by enabling Dolby Atmos. Watching videos has never been this fun, seeing that the Lenovo YOGA Tab 3 Pro is a movie watcher’s dream. Sure, the display is good enough on its own, especially when we can prop the tablet up with its kickstand, but Lenovo’s commitment in making it a multimedia centric tablet is evident by the multi-tasking implementation it offers. And best of all, we can use the built-in projector to change things up from the norm. Like we mentioned earlier, it’s suited best for nighttime use because its peak brightness isn’t enough when ambient light infiltrates the experience. How many tablets can project a video onto the ceiling in your bedroom? Don’t worry, this one is above average with its battery life and recharge time. 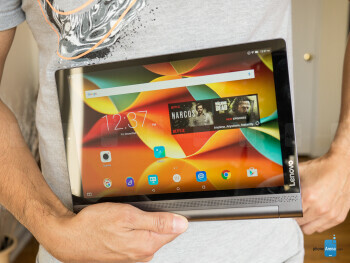 You want to know why this 10.1-inch tablet is heavy? 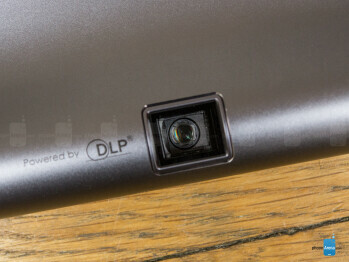 Well, it’s attributed to the 10,200 mAh battery stuffed inside of it, which delivers better-than-average results. Power users will especially appreciate its all-day battery life, ensuring that it won’t sputter out before it’s bed time. Our custom battery test also reaffirms its longevity, where it reaches an on-screen time of 9 hours and 27 minutes. Using the included charger, it’s quite efficient too at recharging because it takes 162 minutes to get back to full capacity. That’s faster than some of the recent tablet’s we’ve come across of late. 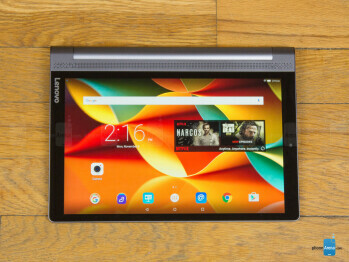 This year’s Lenovo YOGA Tab 3 Pro is better in every single way than its predecessor. Its more compact size makes it more travel-friendly, but they’ve addressed some design concerns we had with the previous model – namely the placement of the projector and certain aspects of the software. What’s really swell in all of this, is that it strikes a chord with both multimedia buffs and professionals that want to get work done. Indeed, its $499.99 price point means that it’s competing against the like of the Apple iPad Air 2, the Samsung Galaxy Tab S2 9.7-inch, and even the Google Nexus 9, but it certainly offers an entertaining package for the money. The specs are good, the software is improved, the battery life is long lasting, and the projector certainly has its added benefits. All of this just points to a tablet that shouldn’t be overlooked.